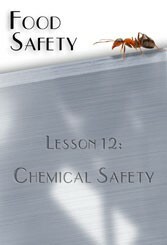 Cleaning chemicals can be a hazard in the kitchen. It is important that chemicals are labelled, stored and used in the same way that the supplier has instructed you. This video looks at the 5 basic steps when cleaning and sanitizing food contact surfaces as well as the importance of cleaning schedules. 5 minutes.